We probably haven’t seen the last of engineers who insist on designing local streets like surface highways. But at least now they can’t claim their hands are tied by federal regulations. Last week, the Federal Highway Administration struck 11 of the 13 design rules for “national highways” — a 230,000-mile network of roads that includes many urban streets. 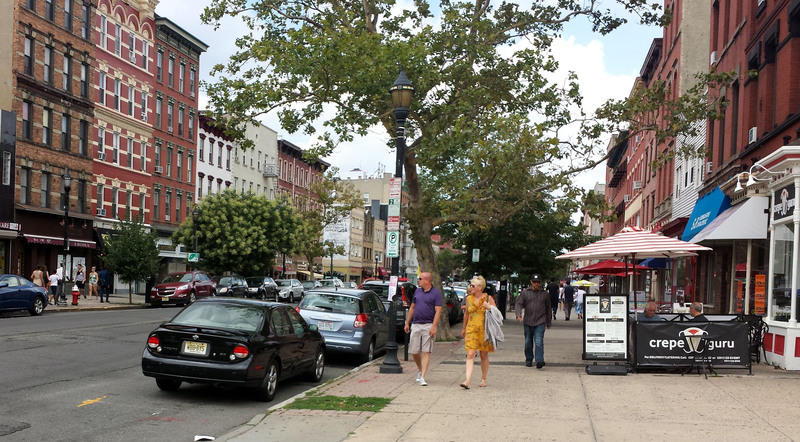 The rule change eliminates a major obstacle to safe street design around the country. The old rules applied highways design standards — wide lanes, no trees — to streets that function more like main streets, with terrible consequences for safety and walkability. In October, FHWA proposed eliminating all but two of the old standards on streets designed for speeds under 50 mph, citing a lack of evidence that the rules improve safety. Now, those changes are official. Ian Lockwood, a consultant with the Toole Design Group and formerly the transportation director for West Palm Beach, Florida, said the changes are important. The new rules open the door to treatments like road diets, bike lanes, and street trees — the kind of street designs that lead to a safe pedestrian environment, not high-speed traffic. “This allows the designs to better support the place and not so much how fast people can drive through it,” he said. Prior to the change, if local agencies decided to make car lanes that were narrower than what the feds prescribed, they would have to go through the expensive and time-consuming process of applying for an exemption. New Haven, Connecticut, for example, had to apply for more than half a dozen exemptions when it designed a surface boulevard to replace a grade-separated section of Route 34. After the new regulations were first proposed in October, the FHWA received 2,327 public comments. The feedback was overwhelmingly supportive, the agency says, with only seven people opposed. Lockwood thinks the update is a good sign about the direction FHWA is steering federal transportation policy. “What used to be a very, very highway-oriented group are now trying to help,” he said. Good, we’re finally reversing the course set half a century ago. I think the costs of owning a vehicle will return us to the days where only the rich drive cars, and violently at that. Only now, no horses in the way. The 230,000 mile national highway system is less than 6% of the 4,000,000 mile U.S. road system. If a road is going to treated as a local street it should be removed from the national highway system. Doesn’t the state government pay to repave (maintain) state highways, including the one downtown you call Main St.? So City Hall likes them. Don’t know if federal funds pay for repaving U.S. highways thru small down main streets, but probably so. Again, local officials need the money so they like it like that. What Woody said. “National highway” status means federal money, so the cities like it for that reason. Most of these “national highways” are things like the US Routes and State Highways, which tend to run right through downtowns, and always have. It makes sense to design them for high speeds *outside the downtowns*, but when they reach downtown, the speed drops to 30 mph or lower, as it should, and they shouldn’t be designed as speedways in downtown. These are supposed to let you drive from one downtown to the next, not speed past every downtown. Electric cars don’t seem to inspire as much road rage in the driver as gasoline cars. It’s just way more comfortable to follow a bike at 10 mph in an electric car than an in gas car. So that might help.